Today, the Jon Bon Jovi Soul Foundation launched a mobile app developer challenge called Project REACH to aid the homeless and people facing economic challenges. The contest, in partnership with the Department of Veterans Affairs (VA) and the Departments of Housing and Urban Development (HUD) and Health and Human Services (HHS), asks developers to create a free, easy-to-use web and smartphone app that will provide up-to-the minute information about available housing, health clinics and food banks for those in need. Prizes for creating a winning app range from $10,000 for five finalists to $25,000 for the grand prize winner. The contest’s chief goal is to establish a nationwide program that will allow clinics, food kitchens, and shelters to update their available services in real-time online. The winning developer will feed the information to communities throughout the country. 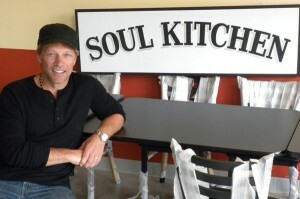 Five finalists will pilot their mobile applications at JBJ Soul Kitchen, a community restaurant in Bon Jovi’s home state of New Jersey where diners pay only what they can afford. For more information about Project REACH (Real-time Electronic Access for Caregivers and Homeless) and to enter the competition, go here. The Jon Bon Jovi Soul Foundation combats issues that force families and individuals into economic despair. Through the funding and creation of programs and partnerships, it supports innovative community efforts to break the cycle of poverty and homelessness. To date, Jon Bon Jovi and the Soul Foundation have provided affordable housing for hundreds of low-income individuals and families. In December 2010, President Obama appointed Jon Bon Jovi to the White House Council for Community Solutions, which seeks to understand and assist vulnerable youth find pathways to success.